Stone Images VIII features the twenty best stones from the past seven Stone Images exhibits. Since the first show in 2010, over 250 different viewing stones have been displayed from all over the Pacific Rim, including the Pacific Northwest, Wyoming and Alaska. 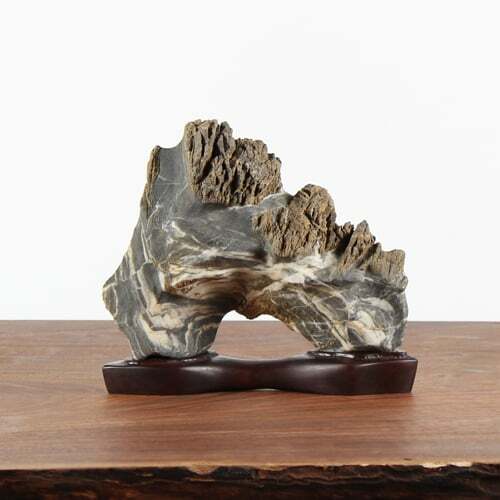 Viewing stones, or suiseki as they are called in Japanese, are naturally formed stones valued for their beauty and ability to represent a scene from nature. This can include anything scenic vistas, animals or embedded images. Believed to have originated in China two thousand years ago, the ancient art form was introduced to Japan in the sixth century A.D. and has been practiced ever since. When paired with bonsai each enhances the qualities of the other and creates a scene that would be found in nature.